Sydney Sixers 5-141 (Shane Watson 47, Brad Haddin 32, Aaron Phangiso 3-14) beat Lions 9-137 (Gulam Bodi 61, Jean Symes 23, Mitchell Starc 3-19) by five wickets. Sydney Sixers proved too difficult for the Lions and won the important game by a big margin with sheer team work in the Champions League Twenty20. The Lions scored 137 runs for the loss of nine wickets in the allocated 20 overs and Sydney Sixers achieved the target by thrashing 141 runs for the loss of five wickets in 19 overs. 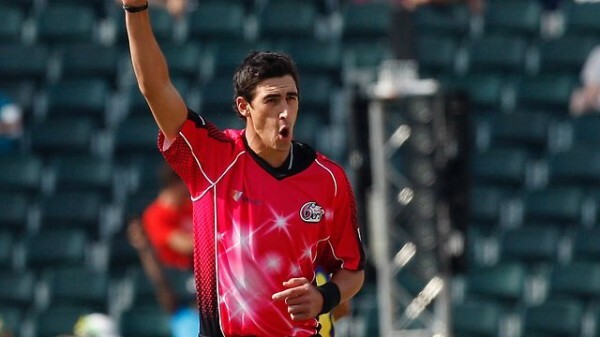 Mitchell Starc (Sydney Sixers) was declared ‘Player of the match’ for his lethal fast bowling as he grabbed 3-19. The Champions League Twenty20-Group B match between the two teams was played on Thursday, October 18, 2012, at Newlands, Cape Town. Brad Haddin, the skipper of Sydney Sixers, won the toss and invited the Lions to bat first. Gulam Bodi along with his captain Alviro Petersen opened the innings in a steamy way and the first over resulted in 14 runs with 2 fours from the first. Bodi hit the initial six of the innings in the next over but the first wicket was lost at 25 when Petersen was gone for five runs in the third over. Bodi carried on with his positive innings as the other batsmen found it hard to score from the opposite end and the wickets kept on falling. He added another 14 runs in the seventh over with one six and a couple of fours. Gulam Bodi scored his second consecutive fifty of the tournament in the 12th over and became the fifth victim after smashing 61 off 44 balls with 3 skied sixes and 4 fours. The fifth wicket was lost at 120 in 17.1 overs as Jean Symes and Chris Morris went into double figures by scoring 23 and 14 runs runs respectively. The lions reached 137 with one wicket remaining when the last ball of the 20th over was bowled. Mitchell Starc was the star performer with three wickets, Josh Hazlewood and Shane Watson held two as Moises Henriques claimed one wicket. The Sydney Sixers started their innings quietly with Michael Lumb and Shane Watson by scoring 11 runs in the first three overs but added 11 runs in the next over with 2 fours. The run rate picked up in the sixth over which produced 19 runs with 1 six and 2 fours from the willow of Watson. The first fifty of the innings was attained in the eighth over and the first wicket association gathered 60 runs in 8.2 overs. Aaron Phangiso put the brakes on the scoring by claiming the wicket of Micheal Lumb on the third ball of the 9th over for 22 and Dominic Thornely lost his wicket for a duck two balls later. Brad Haddin joined in next with Watson who added another 10 runs in the 10th over as the first was dropped on the second ball of the next over by Phangiso at his own bowling. Phangiso got rid of Shane Watson on the fifth ball for 47 off 38 with 3 huge sixes and 4 fours. Sydney Sixers were 3-74 as Haddin changed his gears in the 14th over and hit three back to back sixes on the bowling of Jean Symes. 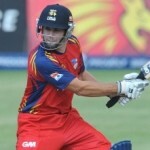 He was caught at long-on by Quinton de Kock off Dirk Nannes for 32 off just 21 balls with 3 lofty sixes and 1 four. Sydney Sixers required 14 runs from the last 18 balls as Steven Smith hit the winning four on the last ball of the 19th over. Smith occupied his crease with 25 off even balls with 2 fours as Sydney Sixers piled up 141 runs with half of their side back in the pavilion. Aaron Phangiso was the highest wicket taker with three whereas Dirk Nannes and Chris Morris got one wicket. Sydney Sixers maintained their unbeaten record in the tournament and clinched the match by five wickets. They are on top of the pool B with 12 points while winning all three games they played so far and qualified for the semi final spot.